Inhumanity is a sort-of event coming from Marvel in a matter of months--and is spinning directly out of the "Infinity" event that is going on. 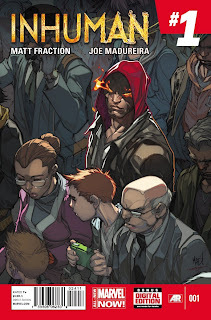 I say it is only sort-of an event because it seems there is no main event comic in the sense we lacking a special mini-series. 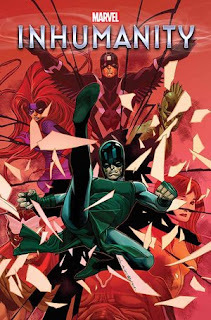 There is a Matt Fraction-penned ongoing comic with the name "Inhumanity", and some comics tying in to the spectacle, but this just doesn't have that "major event" feel. 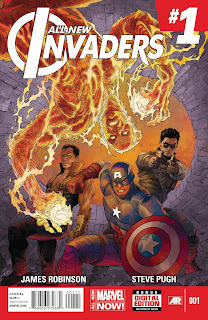 The strangest thing about the "Inhumanity" non-event however is definitely how Marvel are numbering tie-in comics. A series has its normal numbering, so if a comic just finished its 21st issue the next one will be the 22nd, but it will have a little ".INH" next to it. 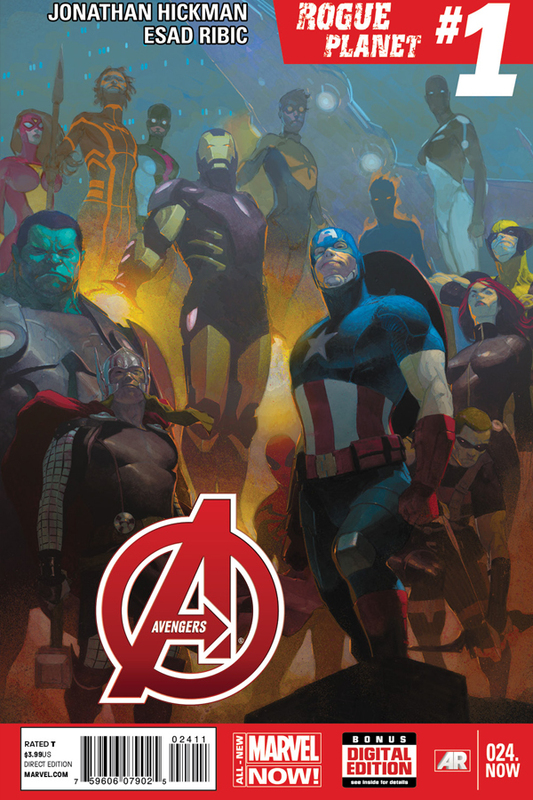 Therefore, "Avengers Assemble #22.INH" will be at your comic shop instead of a comic just simply titled, "Avengers Assemble #22" because it happens to tie into Inhumanity going-ons. There are problems though. For example, please keep in the mind the actual minis and the main comic won't apparently have this logo though. Another issue is that comics already do so many weird numbering schemes that this could easily back-fire and confuse people when they try to organize their comics or even know what order to read new releases. In fairness, the clever part is how this makes it absolutely clear how whatever comic with a .INH you see is a tie-in to Inhumanity. Basically, this is either one of the best ideas ever or absolutely horrible, and I'm not sure which category it truly is, even after looking at those aforementioned pros and cons. but yet ongoing comics that tie-in with the event somewhat less do? 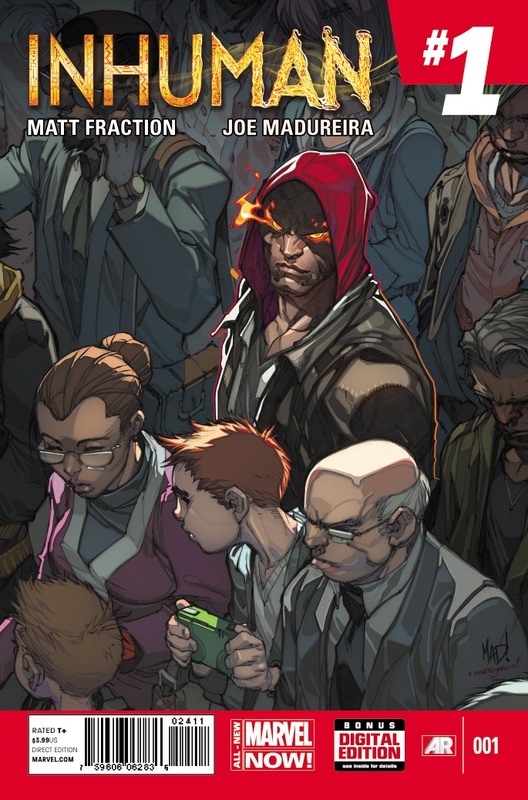 Between Marvel's whole messing with "Point One" comics, DC following suit with Villain's Month's insane numbering(and the company's own huge re-launch a couple of years ago), "Age of Ultron" having its own weird numbering scheme, and any other kinds of numbering-mayhem, it is clear that messing too much with the digits that accompany a comic can cause trouble. One saving grace for this is that it isn't a case where you have an issue of a comic and another one with the same numbering but an additional ".INH". No, the one with the ".INH" is the actual only comic. That keeps things from being too much of a nightmare for an earlier-mentioned potential collector who wants to organize everything, but if some of the comics such as the main series won't even have a ".INH" it seems really odd. Marvel isn't just doing this little trick with their "Inhumanity" comics either, you have some of the comics that are a part of its big "Marvel Now" branding starting to carry their usual numbers and a ".NOW" logo. 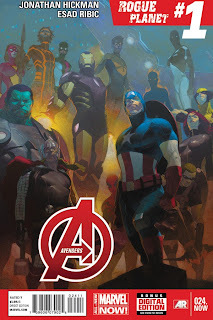 Therefore, we have "Avengers #24.NOW" alongside the aforementioned, "Avengers Assemble #22.INH" and we should not forget, "Avengers: Age of Ultron and Infinity Aftermath #1.INH.NOW" which doesn't actually exist but could soon enough at the rate we are are going with all the Avenger comics and weird numbering schemes. Oh, and not even all the comics in this upcoming 2nd-wave of Marvel NOW will be have that logo, a new Invaders comic, appropriately titled, "All-New Invaders" lacks it. Ummmm, what? plus there is a logo about how this is the first issue of a new story. Clearly this can go a variety of ways, and who knows if the comics will even be good enough for it to matter? Matt Fraction can make some incredible stuff ("Casanova", "Hawkeye") but then will sometimes turn out tripe such as "Fear Itself". 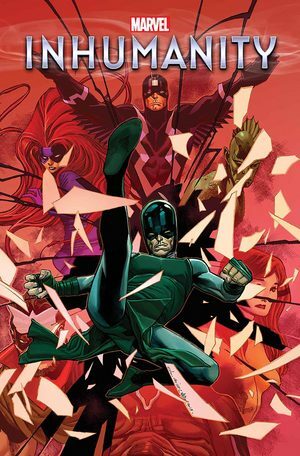 I am excited that Warren Ellis of all people will be co-writing some of those "Avengers Assemble" comics with Kelly Sue Deconnick--especially as their little collaboration on a back-up story that appeared in the amazing "Osborn" series was quite stellar. It is just odd that Ellis seems to literally be popping in and doing a little scripting for a book as if he were some sort of fill-in writer (which do exist, although fill-in art is more common). I'm unsure if all of these ".INH" and ".NOW" signifiers next to a comic's number will matter much in some years when folk could very well not remember what ".INH" even meant if the sorta-event bombs. Then again, should this non-event-event be a major success numbering could be greatly impacted on other comics from all sorts of publishers. DC could take the Batman "Zero Year" comic and make them have a ".Zero" next to the titles for all we know (okay, that is event is already going on so they aren't going to start that, but you know what I mean). but doesn't have a ".NOW"? What is going on here? I'm genuinely interested to see how successful these comics are, and hope the stories turn out well. I won't be reading too many of them because I am both a bit tired of events and have gone into great detail about how I dropped and am continuing to drop a lot of comics from my pull-list to save money. Still, I hope folk tell me good things.